The first-ever article on this blog was a quick introduction to the Particle In Cell (PIC) Method. That article (and the follow up example) discussed a two-dimensional Cartesian implementation. The ideas presented there are easily extended to 3D codes. But many engineering applications exhibit azimuthal symmetry. For instance, I mainly specialize in electric (i.e. plasma) spacecraft propulsion. Hollow cathodes, used to neutralize the plasma beam, are cylindrical in nature. Similarly, Hall effect thruster (HETs) are also typically studied with two-dimensional axisymmetric codes (although that assumption was brought into question by recent observations of a “rotating spoke” mode at Princeton’s PPPL, see Parker, et. al, APL 97, 091501, 2010, pdf). Having said all that, how do we go about developing a particle in cell (PIC) code in cylindrical coordinates? This article will show you how. Moving from a 3D “xyz” code to a 2D “xy” code is relatively simple. An XY code models a slice through an infinitely deep slab, such plasma flowing around a very long cylinder. Modeling this with a 2D code instead of 3D simply requires using a two-dimensional mesh, and replacing cell volumes with the cell areas, since unit depth can be assumed. Similarly fractional areas are used for scattering and gathering between particles and the mesh. An RZ code shares similar traits but there are two notable differences: 1) cell volumes grow with distance from the axis of rotation and 2) particle push must take into account the cylindrical geometry. To demonstrate the technique, we’ll develop a simulation of a simplistic ion gun. The geometry is shown below in Figure 1. In this example, we’ll use Python with the numPy and sciPy libraries. If you don’t have Python installed yet, the easiest way to get everything in one step, including the Spyder IDE is to download Anaconda. Figure 1. Problem geometry. Note that we are imposing a 100V potential drop across the aperture. Also, despite calling this method “RZ”, the code is actually “ZR”. The Z axis is the horizontal, and R is the vertical direction. We will refer to “Z” with the “i” index and to “R” with “j”. With this formulation, the third axis is theta, and it points “out of the screen” in the positive direction. where we assumed axial symmetry \(\partial \phi/\partial \theta=0\). We can alternatively implement the solver using numPy’s vector operators. The solution is shown below in Figure 2. You can see how the potential drop across the aperture optics creates a focusing effect that accelerates the ion beam. This type of configuration is also used to accelerate the ionized propellant in ion thrusters. 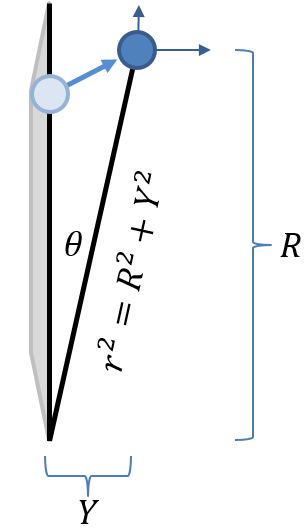 The electric field in cylindrical coordinates is computed the same way as in Cartesian coordinates, since \(\nabla_R = \nabla_C\). Note that this code is not quite correct. It will use the central difference across solid boundaries, but in reality, we should use a one-sided difference. But for the sake of this example, this is sufficient. Ok, so now we have all we need to compute the forces acting on the particles. But how to actually perform the particle push in cylindrical coordinates? We will do this by pushing the particle in a 3D Cartesian system, but then rotating the particle back to the RZ plane. We retain all three components of velocity. The third components is not \(u_\theta\) but a Cartesian velocity out of the screen, \(u_y\). As such, most particles will end up outside the RZ plane after the push. This is shown graphically in Figure 3. In this notation, “Y” is the perpendicular distance from the plane. “R” (in capital letters) is the radial component of position after the push. The new radial distance, taking into account the movement off the plane is given by the lower case r.
And that’s it. You can download the entire code from the link below. It runs slow as molasses for me. Since I hardly ever program in Python, it’s possible that there are some obvious (but not to me) ways to speed it up – let me know if you find some! Running the profiler, it appears that most of the computational time is spent in the Gather function. The final ion density is plotted in Figure 4. You can see how the plasma lens accelerates the ion beam. The final ion velocity of ~20km/s agrees reasonably well with the expected 22km/s. The difference is likely due to the ions not having fallen through the entire 100V of potential drop, since they are probably born at locations with potential <100V, and the potential in the plume is slightly higher than 0V. Figure 4. Ion density for the simple ion gun. You can download the Python script here: rz-pic.py. Also, I recently started adding the blog examples to Github. You may be interested in cloning the following repo: github.com/particleincell/PICCBlog. Also, if you would like to learn more about the PIC method, you should sign up for my simulation courses, offered every year. Hi Vijai, I am not too familiar with that. Let me know if you try it and get some speed up. thank you for your nice tutorial. I have one remark: Sometimes it is difficult to use numPy’s vector operators and in this case it is even not the best idea to make the code faster, because there is still a loop (even the biggest one). In this case, you can use numba.jit() for solving the field which makes it in my case 7 times faster than the vectorized version. I had nothing to do but taking using loops and write @numba.jit() before function declaration. First time compiling needs like 700 ms, but afterwards it is like 10 ms per calculation. Thanks for the info, Daniel! Thanks for the excellent example! Very well put together and easy to follow. I do have a question regarding the node volume calculation however. Why is the node volume not simply dz*(R(j_max)**2-R(j_min)**2)*numpy.pi? Why do you need a=0.5 on the boundaries, don’t the two if statements just above take care of that? And don’t you need that pi in there to get correct numverical results (although not qualitatively different)? Ah wait, I see know that the factor “a” deals with the boundaries on the z axis while the if statements deal with the boundaries on the r axis. Still confused about the missing factor of pi however. Hi Grant, that \(\pi\) could be included for “completeness” but it doesn’t change results. Number of particles to create is computed by multiplying ionization rate by dV, and density is later computed by dividing by dV, so any constant scalars just get cancelled out. So, it is a cartesian to cylindrical code essentially, right? Changes made to a cartesian code to model cylindrical geometry, if that’s what you mean.